A young Barry Martyn with Jim Robinson, Kid Sheik, Alcide Pavageau, John Handy, and George Guesnon. New Orleans, 1963. Set forth below is the thirty-seventh “Texas Shout” column. It first appeared in the March 1993 issue of the West Coast Rag now the Syncopated Times). Because the text has not been updated, I should mention that the South Frisco Jazz Band disbanded as a regular working group at year-end 1998. Each of the seven styles of Dixieland uses all three skills. However, the degree of importance assigned to a given skill differs depending on the style being played. “Reading skill” is the ability to execute preplanned notes (whether written down or as part of memorized “head” arrange­ments) with a jazz feeling so that they sound spontaneous and blend properly with the other instruments. The hot dance Dixieland style places its highest values on this skill. “Solo skill” is the ability to play jazz solos that are creative, presenting a distinctive, personal and fresh vision of the selection. Chicago style, the only solo-oriented Dixieland style, con­siders this skill the most important of the three. 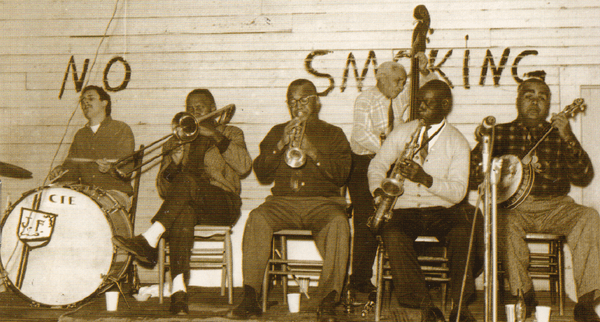 The other five Dixieland styles – white New Orleans, downtown New Orleans, uptown New Orleans, West Coast revival and British trad – rank ensemble skill highest. With the majority of the bands at most of today’s festivals probably being uptown New Orleans, West Coast revival or British trad, ensemble skill thus becomes, at many weekends, the most critical one on the scene. However, for reasons explained below, it often goes unrecognized and unrewarded by audiences, and sometimes even by musicians. That’s because ensemble skill is an invisible skill. Success at ensemble playing requires complete selflessness, per­formance at all times solely for the benefit of the band without unduly calling attention to one’s self. I’d like to use the rest of this column to make this important ability a little more visible, to draw your attention to it and give you some idea of how you can go about recognizing it. Let’s start by defining it more precisely: “Ensemble skill” is the ability to listen simultaneously to as many as seven other musicians all improvising around you, to assimilate these seven lines, and to concurrently improvise exactly those notes that will complement and en­hance their work, thus making the whole greater than the sum of its parts – while also making your own personal and original statement within the overall picture. Sounds difficult, doesn’t it? You better believe it. Ensemble skill is an ability one acquires only via steady, dedicated playing with other improvising musicians, both live and — to experience the challenge of working with different approaches and the best jazzmen – along with recordings. The high value placed on ensemble skill in five Dixieland styles explains why a bandleader in one of those styles typically makes the seemingly odd, but usually correct, decision to fill a vacancy with an instrumentalist who is deeply committed to the style vs. a more technically accomplished but less devoted performer. Great technical skill is not normally required for effective Dixieland ensemble playing. Dixieland is the branch of jazz in which the largest number of musicians can be improvising at once without need for any sort of written charts. In swing, bop and more advanced styles, with their busy lines and complex chords, an arrangement is needed to keep ensembles from being too cluttered if you have more than about five players on stage. With Dixieland, you can have as many as eight before charts are needed. However, with eight improvising Dixielanders, no one player has a lot of room in which to operate. The role of each instrument in a Dixieland ensemble is very specifically defined. A player who steps out of this role, by going too far outside the normal range of his instrument, or by playing too many notes, will invade territory belonging to another player and upset the balance of the ensemble. For that reason, virtuoso technique, though not to be denigrated, does not necessarily increase one’s ability to play ensemble Dixieland. Playing the right notes is what matters, and those notes may turn out to be a few easy-to-play notes in the mid-range. For example, the great trombonist Jim Robinson had a fairly limited vocabulary of favorite licks and a technique within the grasp of an average junior high school sliphornist. However, Big Jim’s propulsive effect on ensembles, and his expressive use of those licks, was such that he is, beyond question, the most imitated uptown New Orleans trombone player. Why is ensemble skill unrecognized by audiences? Well, think about what happens when you’re watching a Dixieland band. You’ll hear the band execute ensemble passages; during the performances, some of the sidemen will solo – usually the front line horns and pianist, maybe the banjo/guitarist, sometimes the bassist or, more seldom, the percussionist. While the solos are going on, you’re paying attention to the soloists. A flashy solo will inevitably be rewarded with applause and, if the audience has enough seasoned listeners, a good solo (flashy or not) will achieve the same result. Similarly, if a soloist did not get a favorable response, or did not play good solos, you are not as likely to remember him. Indeed, you may conclude that he is not as capable a musician as the soloists who got louder applause – and you may well reach that conclusion without considering whether that musician was actually supplying one of the key ingredients that caused the band as a whole to be successful in ensemble passages. The musician’s ensemble skill has been, except for the most discerning and knowledgeable listeners, invisible. Musicians, though perhaps more knowledgeable as a group than a general audience, may well make the same mistakes as spectators. As a rule, though, they are quicker to recognize ensemble skill when they’re on stage with a talented ensemble player, particularly if the player performs on a rhythm instrument. Still, even in the five ensemble-oriented styles of Dixieland, an artist who plays an instrument that normally solos, and who is a below-average soloist, risks having his ensemble skills go unrecognized by his colleagues. O.K., you say, how do I identify these wonderful ensemble players? It’s sort of a process of elimination, actually. First off, if a band really cooks, if it swings hard during the ensembles, you can feel reasonably confident that each member is a competent ensemble player. Even one weak link in that respect usually prevents the combo from achieving that seemingly effortless feeling of buoyancy and momentum that characterizes hot jazz. Remember each name in the lineup when you see such a hot outfit. If you do so often enough, you will eventually come to realize that there are certain musicians whose presence on stage seems to ensure that the band is going to cohere. You seldom see them working in a situation that produces below-average heat. These are the outstanding ensemble musicians, the ones who find those right notes to play that encourage their colleagues to perform at peak and which knit the group into a swinging unit. Names? Many of them are good soloists as well, and today’s column is not really designed to give soloists more publicity. As for the good ensemble players who are below-average soloists, I’d just as soon not single out any contemporary musicians for that type of two-faced distinction. You can find them for yourself using the above-described procedure. Two names on the current scene come to mind, however, relating to jazzmen who almost never take solos, who’ve concentrated on developing themselves as bandsmen. Both have done a superb job in that respect. Tubaist Bob Rann’s fruity sound and percussive attack play a pivotal role in defining the powerful beat of the South Frisco Jazz Band. Up to the date of the 1989 South Coast Metro Festival in Costa Mesa, I don’t think I’d ever heard Bob play any other way. At the start of one of The Rent Party Revellers’ sets at that event, Chuck Stewart suffered a mishap to his tuba that required an immediate repair. We kicked off without a bass, while I dispatched Nancy to comb the vicinity for itinerant tubaists. A few tunes later, she showed up with Bob Rann in tow, who was rushed on stage and confronted with our usual list of nearly forgotten numbers, many of which had to be new ones for Bob. I may be too close to it to judge, but I think our rent party approach to rhythm is some distance along the spectrum from South Frisco’s. Bob, however, needed no adjustment at all and fit in as if he’d been a Reveller all his life. There’s a musician who can really play ensemble. Eventually, I came to realize that I was giving favorable reviews to records including Martyn, whether he was leader or sideman, whether the combo was large or small, in circumstances involving a wide variety of other sidemen. Therefore, he has the ability to play in a manner that pulls the band together and gets it off the ground, a first-rate ensemble musician. To give you a more concrete example, I tried to think of a vintage-period jazzman who is regarded as an indifferent soloist but a fine ensemble player. This is not an easy task, as we all differ in our assessments of any given artist’s solo talents. Left to myself, I would nominate Jimmy Archey for that category. I’ve always enjoyed any recordings on which he played, although his solo style usually strikes me as limited and monotonous. However, my view of Archey is hardly the universal one. The eminent critic Rudi Blesh regularly included Archey on his historic “This Is Jazz” broadcasts, something he would not have done (given the wide selection of jazz talent available to Rudi in New York City) if he had thought Archey to be deficient in any respect. Moreover, in his recent book The Jazz Crusade, author Bill Bissonnette lavishes special praise on Archey’s soloing. There is one name, though, that provides, for me, the perfect illustration of the point being made in this column. The individual in question appeared on literally hundreds of vintage jazz recordings, including many of the greatest classics in the field, often in the company of such immortals as Louis Armstrong, Sidney Bechet, Bessie Smith, King Oliver, James P. Johnson and Willie “The Lion” Smith. He was, among other things, a singer, bandleader, jug player and composer or co-composer of some of the most beloved tunes in the idiom. His main instrument was the piano; when commenting on his pianistics, the virtually unanimous critical assessment has been that his tickling was, at best, bland and competent – however, I do not recall reading any critical comment that addressed his abilities as an ensemble player. I am speaking, of course, of Clarence Williams. Recordings on which Williams performs are constantly being reissued, invariably to favorable reviews. Per­sonally, I’ve never heard a recording including Williams that I felt wasn’t worth hearing. While Williams may not have been an arresting soloist, no one could pos­sibly have made so many good recordings, in such a variety of combi­nations and contexts, unless he was an exceptional ensemble musician. One could argue, I suppose, that Williams was a bandleader and that his beneficial effect on his cohorts was primarily due to his leadership skills rather than his ensemble skills. There may be some merit to that position, but I am not persuaded by it. Williams’ discography embraces ses­sions with musicians who were themselves forceful personalities, people who knew what they wanted, and who were in many cases the leaders on the dates – Oliver and Bessie, for example. Even when they were sidemen, individuals like Bechet and The Lion were not given to letting themselves be pushed around. Still, once the studio light was on, with Williams in the band, they turned out jazz that still connects after all these decades. Something about Williams’ playing had to be a significant factor in bringing about that result. He and others like him deserve to be recognized for that achievement. Thus, let’s be more alert to giving credit where credit is due. The next time you see a combo that’s hitting on all cylinders, that’s turning out a swinging beat that compels you to respond and which lifts your emotions, remember that every jazzman (or woman) on stage, not just the soloists, is a vital cog in producing that result. Each has mastered a difficult and important – perhaps the most important – skill in his branch of Dixieland. Remember their names. When you want more of the same, look for bands that include some of those names in the personnel. If you do so, I predict that you’ll come to a deeper understanding of our music, and spend higher-quality time enjoying it. Previous Why No Texas Shout #36? Next Nicola Farnon Sings and Swings!